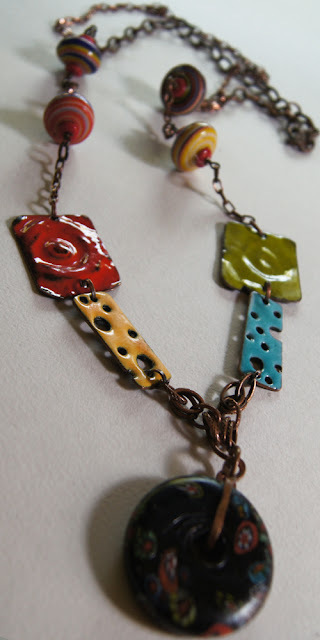 Necklace: Enamelled copper pieces with copper chains, glass and ceramic beads. 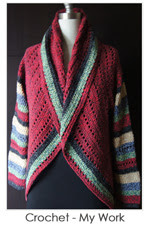 My background is in textiles, yarn actually, but I've always loved jewelry. The love affair began and still continues with vintage and tribal or anything with a vintage vibe. 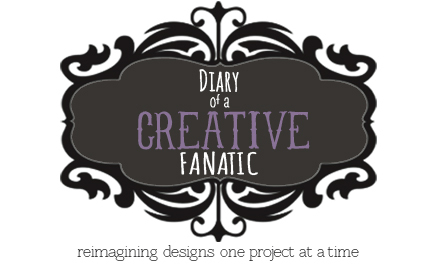 Throughout the years I've collected many pieces, took ones that were broken apart and made new pieces. There was always a curiosity about how jewelry was made, so one weekend I enrolled in a Jewelry I at a community college and continued on with many other courses including casting and enamelling. 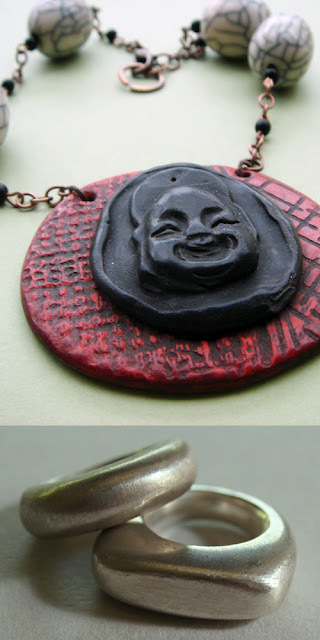 This does not exclude my love of fine jewelry, but my real love is "distressed chic"...a hippy at heart. Below are a few pieces that I've designed and fabricated in a variety of ways, mixing it all up together. Stacking Rings: Wax carved models, cast in silver with oxydized finish. 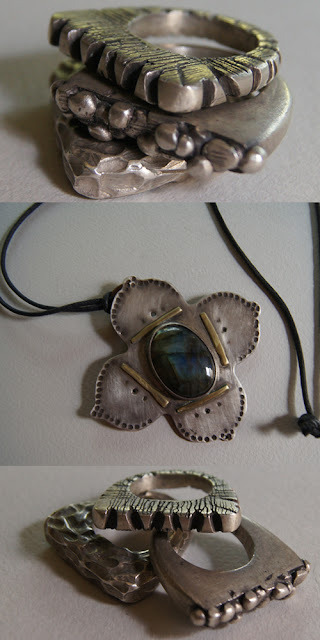 Pendant: Oxydized silver and brass, fabricated and bezel set with labradorite cabochon. 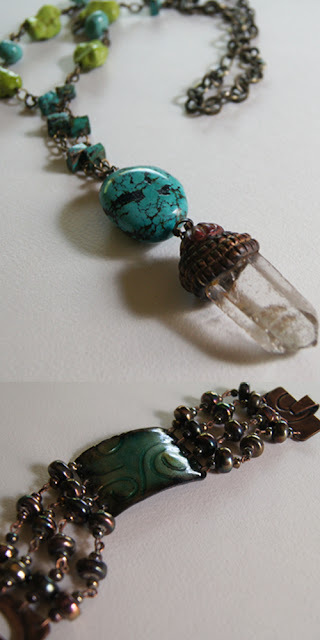 Crystal Pendant Necklace: Crystal with polymer cap, turquoise focal bead, turquoise slices, mystery beads and brass chains. Bracelet: Textured and enamelled copper centrepiece, fabricated copper clasp with glass beads. Cuff: Textured polymer centrepiece with elastic wristband and D-ring closure. 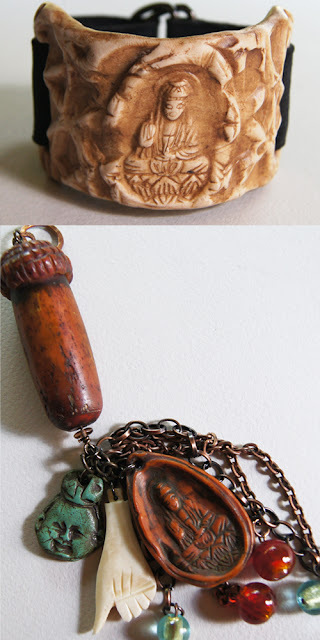 Purse Charm or Pendant: Vintage bone piece with polymer cap, polymer and bone charms, glass beads with copper chains. Necklace: Textured polymer pendant, crackle beads with copper chain.